The bitumen surface on the footpath to Sainsbury’s needs to be repaired as we’ve worn a groove in it today. After breakfast I walked to the Town Basin to see if there was a vacant mooring close to Sainbury’s. Unfortunately a boat pulled into the last mooring as I arrived. Oh well, it just meant longer round trips with the sack trolley. Consequentially our morning was spent travelling between Waiouru and Sainsbury’s. Jan has checked back through her financial records and our last major supermarket restock was late May. After three trips to Sainsbury’s the cupboards have been filled. There was a final trip back to the basin to dispose of the rubbish. It was a lazy afternoon with us sitting in the folding chairs beside the towpath enjoying the sun. Yes… she’s still there Jan! I slipped away to the nearby B&Q for 30 minutes to purchase a replacement 4.5mm HSS drill bit and I will now be able to fit the final handrail cleat. We were standing and chatting this afternoon to Fran (nb Tamara) moored behind us. She reads this blog…… Why??? 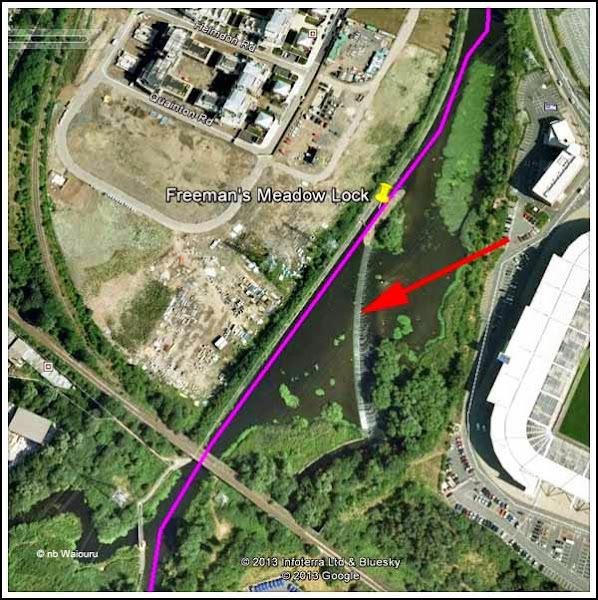 Fran had recently left a comment on the blog providing instructions on where to find a large Tesco in Leicester near to the canal. 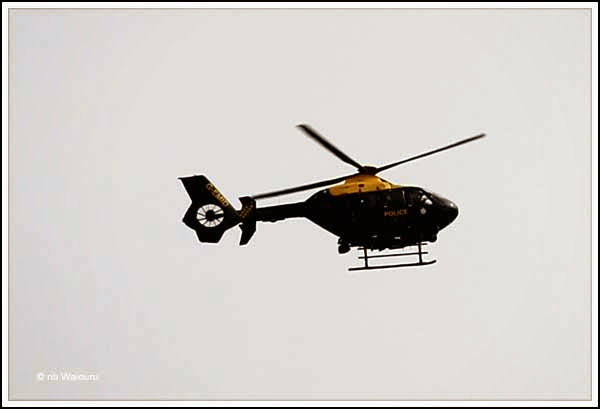 The conversation was interrupted by a noisy helicopter hovering overhead. I had a suspicion the UKBA might have come early for me when a booming voice from the sky started sending instructions to the people on the “blue boat”. Hang on……Waiouru is grey. <phew> Looks like I got away from them this time! 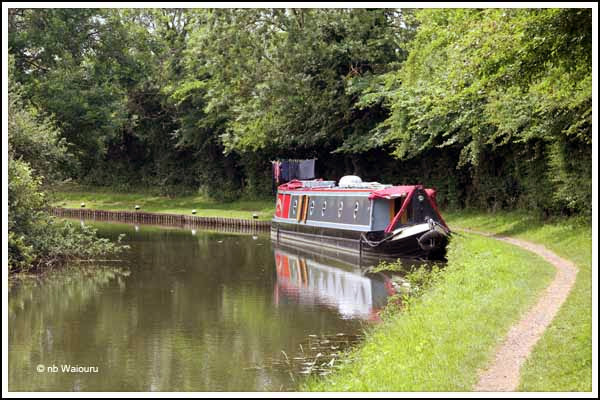 After such a close shave we’ve decided to move tomorrow and find ourselves a rural mooring. Preferably under a tree! Woke to the sound of raindrops on the houdini hatch and lay in bed watching them splatter on the double glazing. Who wants to move in the rain? Who needs to move in the rain? Not us… so we’re staying right where we are! Isn’t this non-timetabled lifestyle great. It actually stopped for a couple of hours before lunch so we decided on another walk into Loughborough. Jan wanted to visit a wool shop she had found on the internet. It appears to have either closed or moved, but there was another around the corner. Nothing purchased and Jan appeared to be happy with some eye candy. There was another open market in the town centre but not the same number of stalls as yesterday. We just wandered around the town before slowly heading back towards Waiouru. Jan pointed out the Elf Shop where she bought the bread yeast yesterday. Blurred photo taken with the phone. 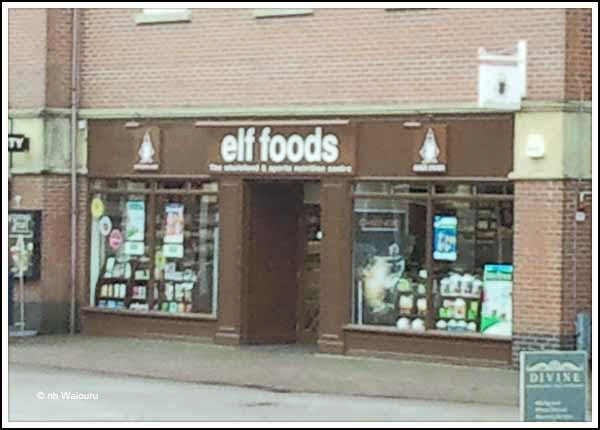 Apparently they sell a large range of elf food and mineral supplements. Around the corner was the Chinese supermarket and in my excitement I forgot to take a photo. We browsed around inside purchasing a bottle of oyster and sweet chilli sauce plus some packets of frozen dim sims and steamed buns which are now in the freezer. The last stop was at Sainsbury’s where we had considered having lunch in their cafe. The menu didn’t look appealing so we purchased all the lighter items on Jan’s long list before walking back to Waiouru. In the afternoon I started the engine to charge the batteries whilst Jan had a lie down on the bed and watched the small TV. Meanwhile I went off with the sack trolley to fill the jerricans. 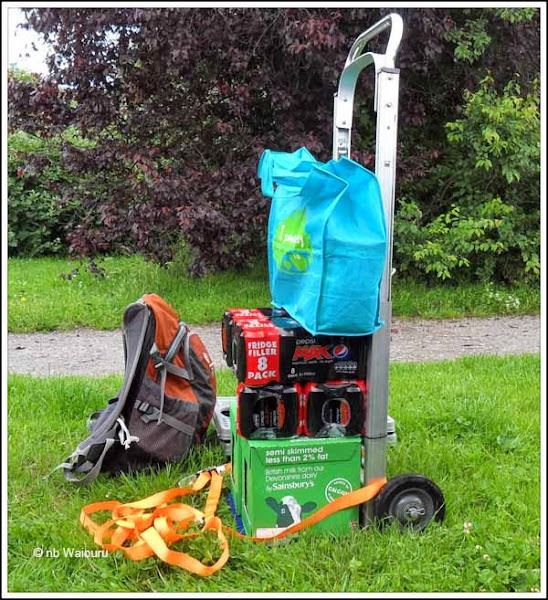 The plan for tomorrow is to moor in the Town Basin (provided there is a vacant mooring) and go to Sainsbury’s with the sack trolley and buy all the bulk heavy items (flour, beer, milk, beer, soft drinks, sugar, beer, frozen’s, beer and meat. Did I mention the beer? The mooring last night was peaceful and the arrival of a second boat moored behind us gave some confidence about security in numbers. The yellow orb was in the sky this morning and the local swan family put in an appearance at the side hatch looking for the “sucker”. Duly fed they moved of to beg elsewhere. 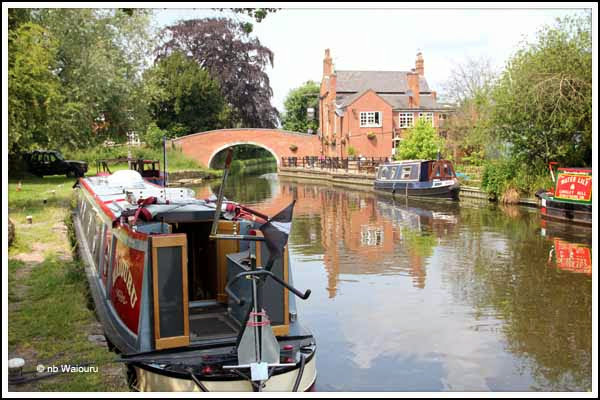 The plan was for me to walk the towpath to Loughborough Town Basin checking the availability of moorings en-route. This proved to be difficult when the said swan family did a Gandalf the Grey on me “Thou Shalt Not Pass”. This proves two things. 1. Swans have a selective memory. 2. 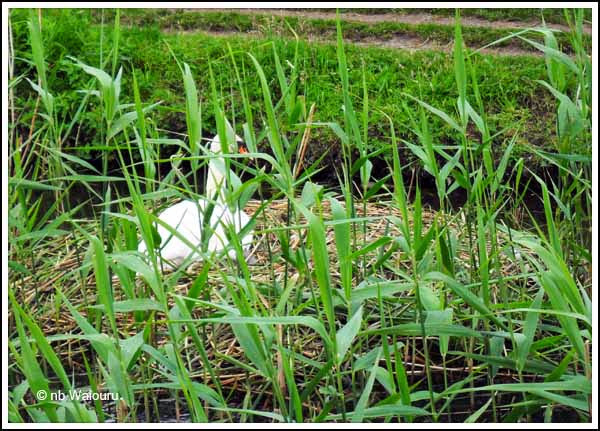 I know a swan family that isn’t being fed tomorrow morning! Rather than resort to violence I detoured away from the towpath and consequentially came upon the Loughborough railway station. The large circular detour brought me back to the towpath on the opposite side to the swan family. 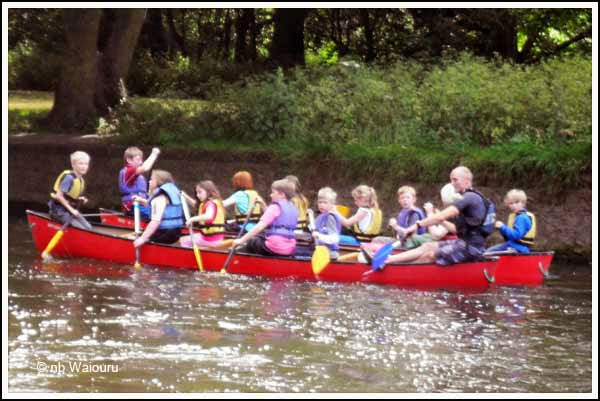 That’s when they decided to vacate the towpath and go swimming……. B@stards! At the Chain Bridge (which is actually made of brick and concrete… no chain to be seen) the canal does a 90° turn to the right. 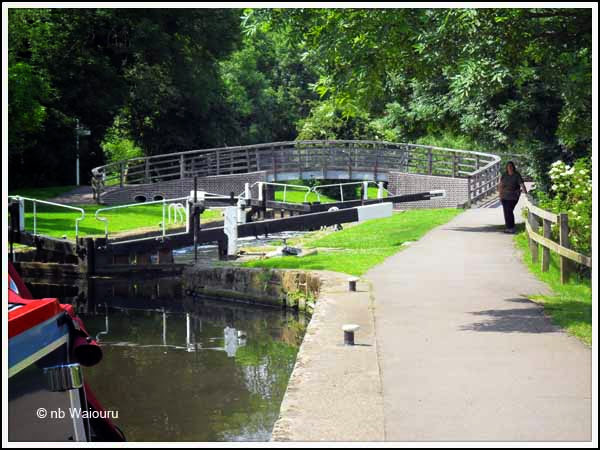 The turn to the left goes down a short arm to the Town Basin where there are six moorings on short ‘finger’ pontoons and a winding point. 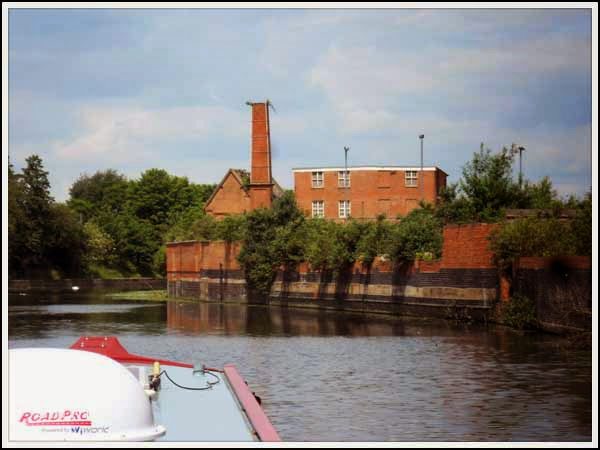 Left to the basin and right to continue up the Grand Union. 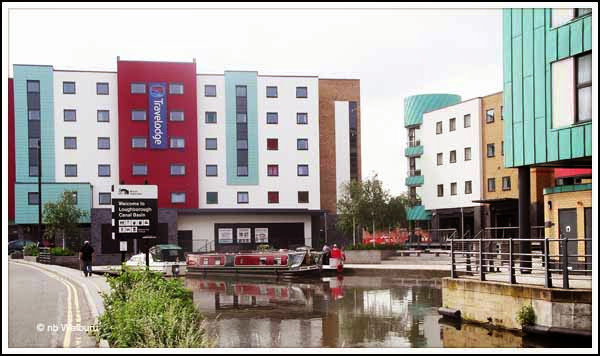 The basin has what looks to be a reasonable new Travelodge at the end and the area appears to have been recently redeveloped. Having completed the quick recce we decided to move closer to the Chain Bridge where we would be within easy walking distance of the local Aldi supermarket. It was an easy 700 metre cruise until we found it wasn’t possible to moor against the edge. Probably the reason why this particular gap was vacant. The ground was also very soft so we used the anchor plates I’d made at Aldermaston to hold the fore and aft mooring ropes with two pins each. Jan walked into Loughborough for some retail therapy whilst I donned my blue playsuit and gave the big noisy green thing in the garden shed a blood transfusion. The engine has now completed 500 hours. This time I got a little more cunning and laid the rubber floor mat on top of the hot engine thereby minimising the potential of burning my nether regions! No impurities or water in the diesel filter so that’s a good sign. The alternator belts are also looking good after the latest tensioning. Jan made it back to Waiouru as the heavens opened. We need more water under the baseplate to get against the bank, but we didn’t want it to be delivered vertically! The forecast for tomorrow doesn’t look much better. Future plans have been rearranged. If there is a vacant pier in the basin tomorrow morning we’ll take it and use the location to visit Tesco & Sainsbury’s to do a major restock. Jan can also visit the large Chinese Supermarket around the other side of Sainsbury’s. We’ve yet to decide whether we’ll stay the night in the basin. It might be noisy! Last night’s mooring at Thurmaston was very peaceful but despite that Jan was awake very early (5.00am) and I followed slightly later. We missed a visit from Lesley (a local) who has lived in NZ and recognised the name on the side of the boat. Lesley was out for an early morning dog walk and thought we might be asleep. That’s a bit of a disappointment as we would have loved to chat. There was some very attractive countryside during today’s cruise to Loughborough. We were quite fortunate in being able to pair up for all but the first lock which halved the workload. 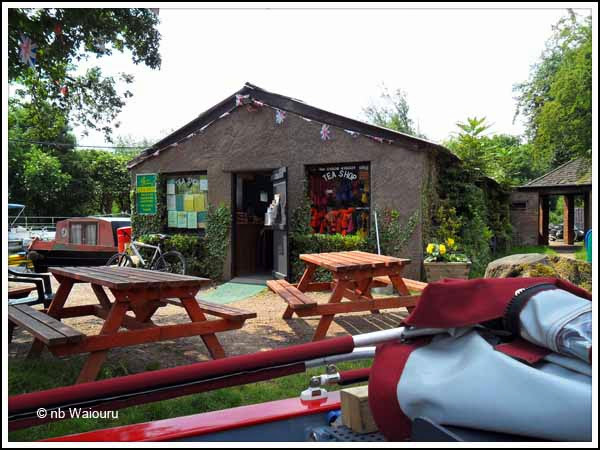 At Mountsorrel Lock and a stop at The Waterside Inn was very tempting. However we pushed on (well more drifted on. 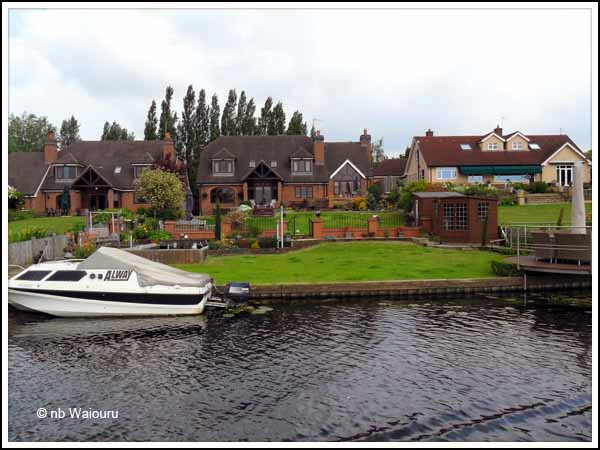 The waterfront properties on the outskirts of Barrow on Soar started to look interesting. The services at Barrow on Soar are rather attractive. We stopped to fill the water tank and whilst waiting Jan cut some ‘doorstop’ cheese & ham sandwiches for lunch. There was a pub opposite with a couple sitting in the sunny beer garden. More temptation! On the services mooring. With lunch finished we disposed of the rubbish and waited for the tank to fill before heading further north. From a distance this sign confused the hell out of me. I went into full reverse trying to work out whether to follow the sign and turn left or continue straight ahead. 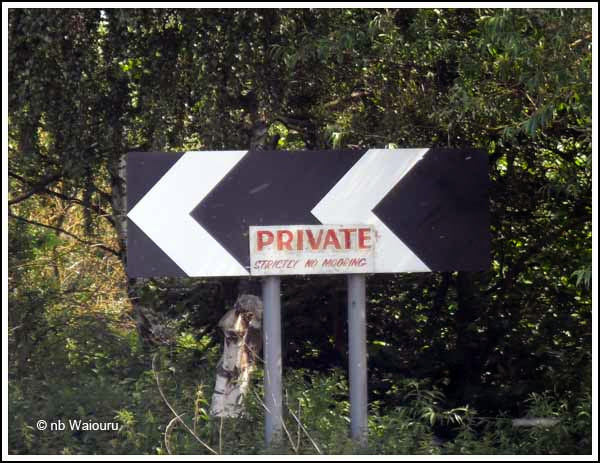 From a distance all I could see was the big arrow and the word ‘Private’. Jan joined me and decided we should follow the arrow. As usual; she was right! 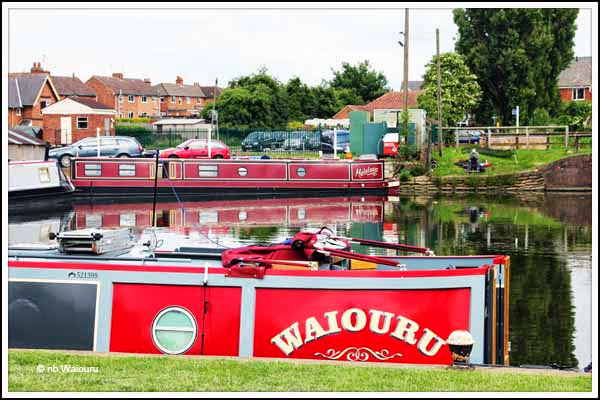 We found a quiet off-side mooring with rings just before the centre of Loughborough where we will spend the night. Tomorrow the plan is to go into town to hit the supermarkets! Mid afternoon we had a visit from David. 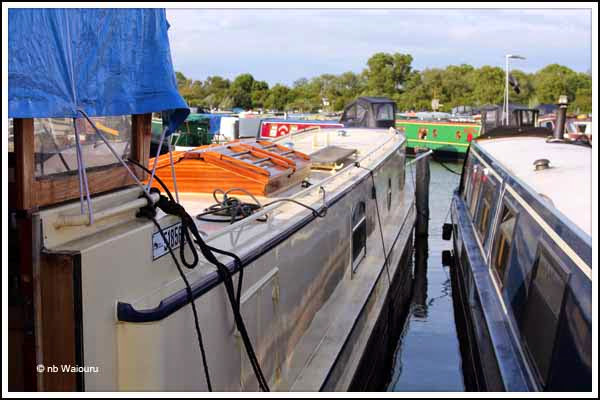 He and his wife Karen had their narrow dutch barge fitted out (badly) by Ben Harp. David was telling me when they took delivery much of the boat was 180° wrong. Turn the wheel to the left and the boat went right. Turn on the hot tap and get cold water. turn on the cold and get hot. The engine cooling system was connected in reverse. The alternators weren’t connected, etc. David assisted us when we had our own problems trying to get possession of Waiouru, for which we’ll be eternally grateful. 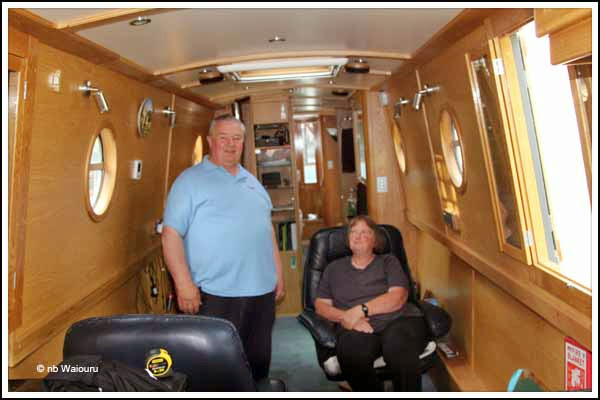 I very much wanted to see David & Karen’s boat as I’ve been reading their blog about the efforts they have been making to rebuild db Trudy-Ann. 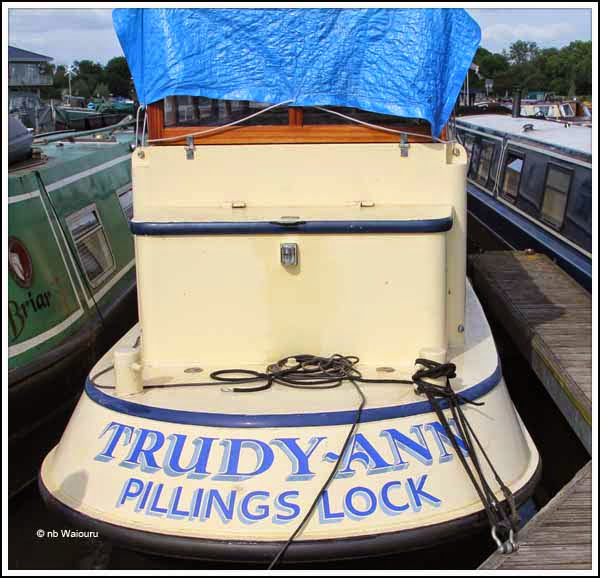 David kindly took me back to Pillings Marina where Trudy-Ann is moored and showed me what he has been doing. 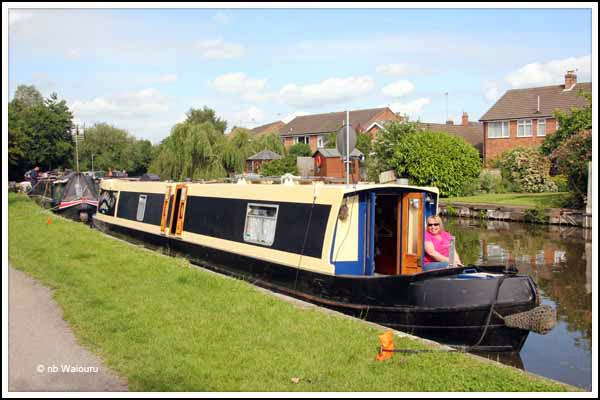 Apparently one of the first things Karen did was sand off the name “Ben Harp Narrowboat Builders” and repaint the stern. Inside David has rebuilt the forward two thirds and plans to have the rest completed by the end of September. 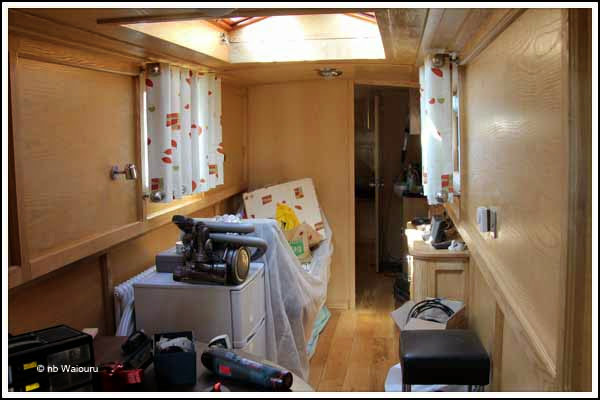 The galley is almost complete which will allow him to reinstate the appliances. Correcting everything has been a mammoth task and I admire David’s tenacity and motivation to keep going. I think he must have been working on the project for approximately five years. It’s interesting seeing inside a narrow dutch barge. There’s no tumblehome and I think the gunwales are higher. However it felt quite spacious inside. This was probably due to the light ash finish. Best of luck with the project David. I’m going to keep reading your blog to follow your progress. A late post today as I’ve just spent two hours after dinner in the garden shed working around the big hot green thing checking the automatic battery watering system. Jan was up at 5.00am and took this photo out the side hatch. It was a long day for us leaving our quiet rural mooring around 8.30am after nb The Waterlodge passed us as we were finishing breakfast. 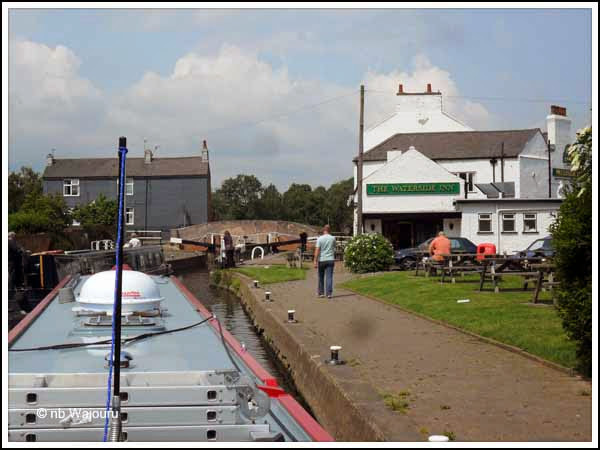 We arrived at the first lock (Blue Banks Lock) just as they were closing the lower gates having passed through. 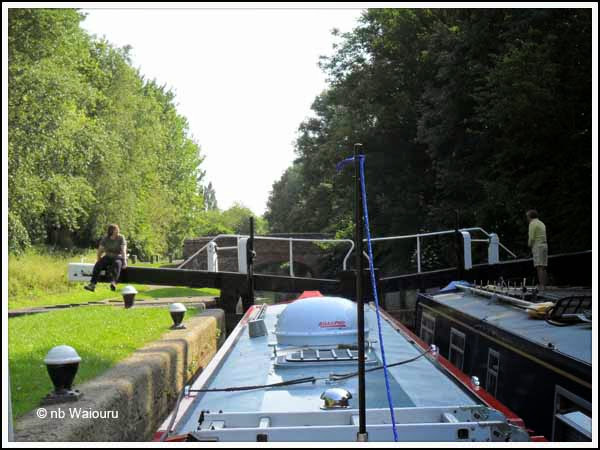 The crew called out to Jan asking if she would like them to wait at the next lock. Jan quickly accepted the offer. As Jan started to fill the lock two “wheel-locking” (a person riding ahead of the boat setting up the lock in advance) ladies arrived and assisted us through the lock. One of them informed Jan they were off two working boats following behind us and there were a further two boats after them. 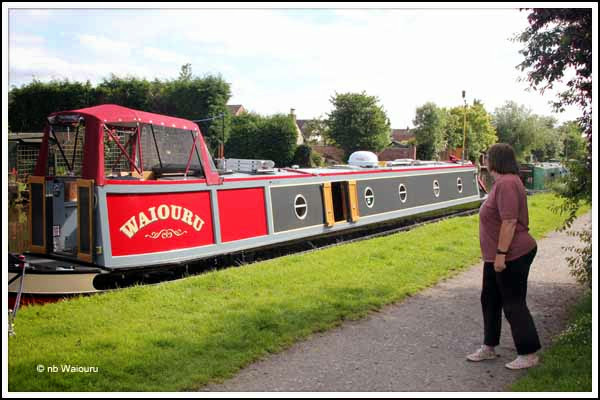 We caught up with Paul and his wife at the next lock and continued into Leicester with them until the mile straight where we moored to shop at Sainsbury’s. We were happy to follow Paul as he knows the canal well. 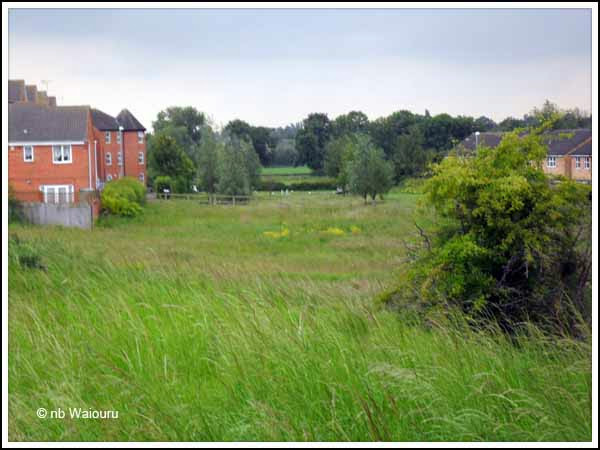 My concerns about Freemans Meadow Lock and the large weir proved to be groundless. There was no problem with the current, however it was possible to imagine how much water might pass over the weir after heavy rain. After mooring in the Leicester Mile Straight we headed for Sainsbury’s with a long shopping list. It’s no longer there! Moreover the adjacent Tesco is very small. Jan was very disappointed, we pressed on with her purse full and our cupboards bare! Some of the bridge architecture is quite interesting. 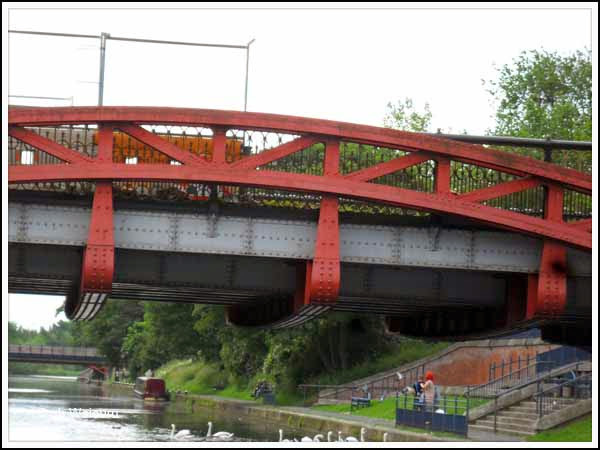 The above is a through arch bridge with suspended transoms. The next bridge and some ornate ironwork. I’m guessing it’s Victorian. Jan must have been taken with it as she photographed the stone columns at the ends. Paul had already warned us the canal could get somewhat ‘ugly’ at the north end of the city. He was right! There was rubbish everywhere with numerous urban jellyfish in the canal and the banks littered with it. Most of the people in the towpath appeared to be ethnically Indian and quite happy to sit amongst the litter. We almost confused ourselves here (next photo). From a distance it looked like the canal went straight ahead. But the low bridge looked strange. It wasn’t until we got closer that we realised it was a weir. No chains, buoys, or signs? I loved the sign on this building “A developers opportunity”. 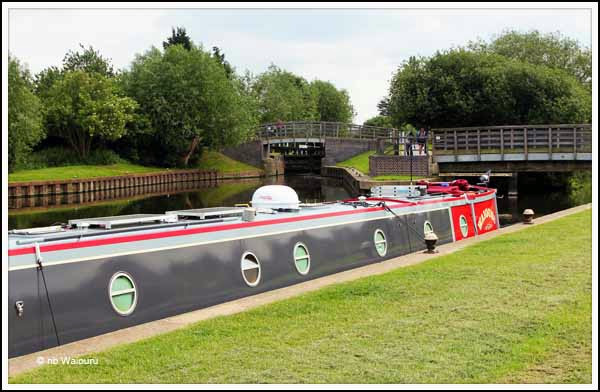 On the outskirts of Leicester was a lovely looking lock that I wanted to photograph. However Jan could see something more interesting behind us which I couldn’t see from Waiouru. A large plastic building. 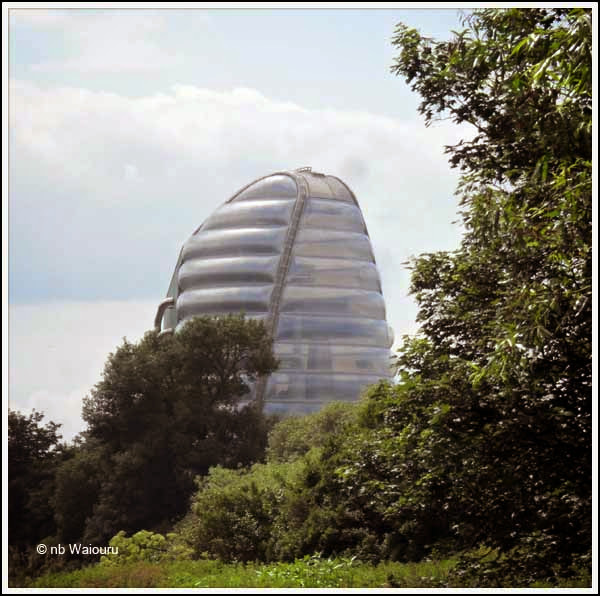 Actually it’s the National Space Centre. The river/canal started to get rural when suddenly we were accosted by three groups of noisy vikings. 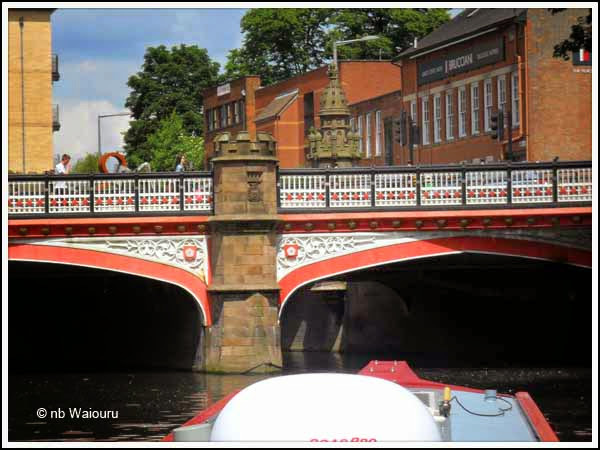 I had read they used to come up the Trent and Soar when raiding but hadn’t expected to see any. They were quite fierce and noisy. 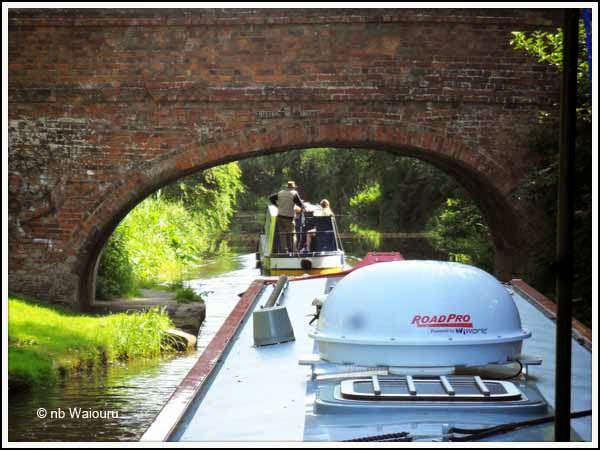 Good to see them making use of the waterways…. and having fun! 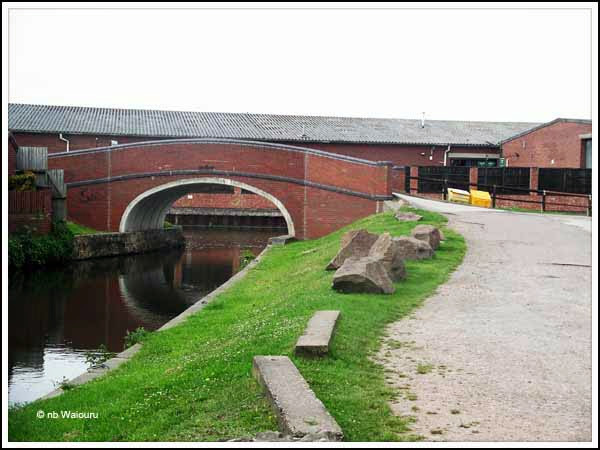 The plan was to moor just beyond Birdsall Lock and walk up to the large Co-op. 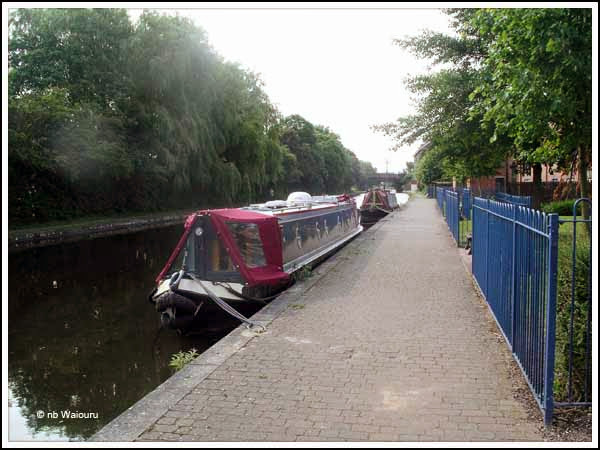 However CRT were working on the visitor mooring and there wasn’t any vacant space. 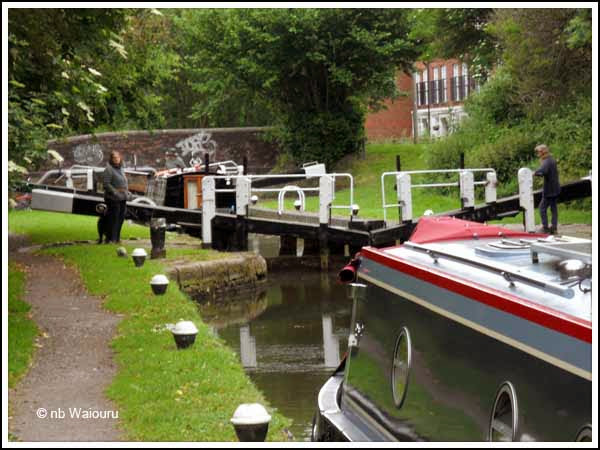 We pushed on to the next lock (Thurmaston). It’s another very attractive lock and as Jan worked us through I spotted a potential mooring with bollards on the far left bank. Jan joined me assisting with the adjusting of the mooring lines before pointing across to the far bank and exclaiming “Look!” “Look at what?” Says me! “Muleless!” Says Jan. And there she was on the far bank. 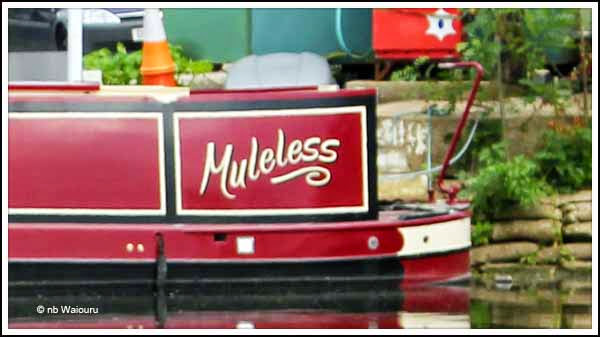 Nb Muleless blog link <here>. Gary & Della she looks lovely. There were two guys working on her! Clank… Bong…..Clunk! 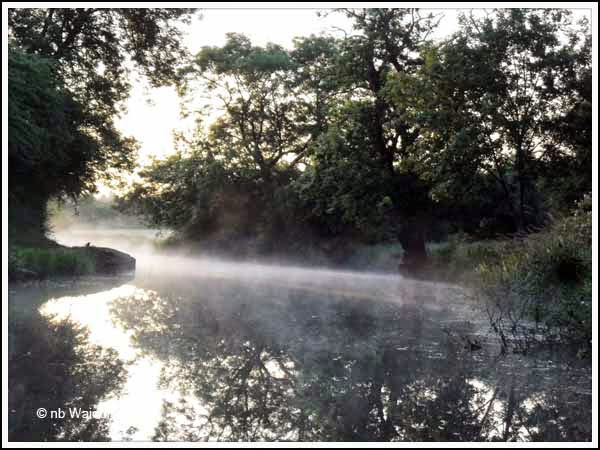 The penny dropped…… MGM Boats at Thurmaston. This is where nb Chance was built for James and Doug. 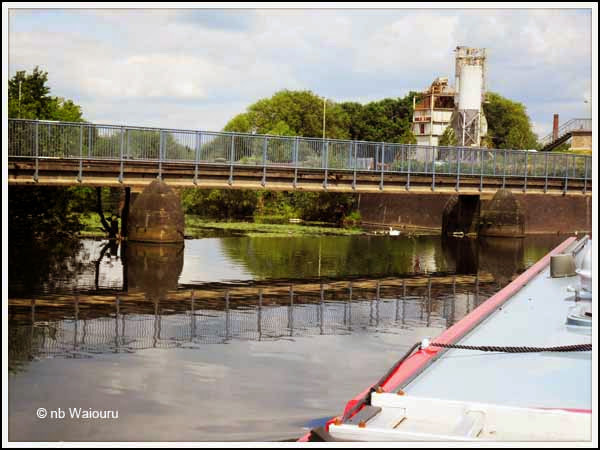 Looking back at the lock with Waiouru in the foreground. It’s been a mixed day with a mixture of lovely scenery and some disgusting litter. More cruising tomorrow! Time to move on and so this morning we simultaneously emptied the rubbish bin, filled the water tank, and put on a load of washing. The Candy had finished its cycle before the water tank had filled so we now have a full tank of water. Whilst at the water point a hire boat arrived. They needed to empty their two toilet cassettes and told us their tale of woe. Apparently the ‘full’ indicator hadn’t worked on the second cassette and was stuck in the toilet. The bowl was also full. And people say pump out toilets can be a problem! The plan was to cruise for half the day dropping down through seven locks to find a mooring somewhere around Gee’s Lock which is slightly rural. The idea being we won’t be disturbed and will be within ‘striking distance’ of Leicester. It was actually quite pleasant cruising though the southern end of South Wigston. 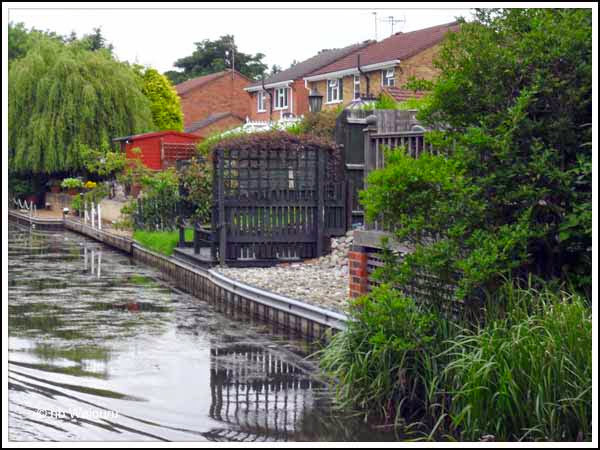 The residents appear to have embraced the canal and a number even have moorings at the end of their gardens. The only resident who wasn’t friendly was Mr Swan. As we turned the bend he saw us coming and rapidly swam towards us puffing up his wings in an aggressive display whilst “hissing” at Waiouru. It seemed rather daft to pick an argument with 20 tonnes of narrowboat. But 100 metres later we understood why! 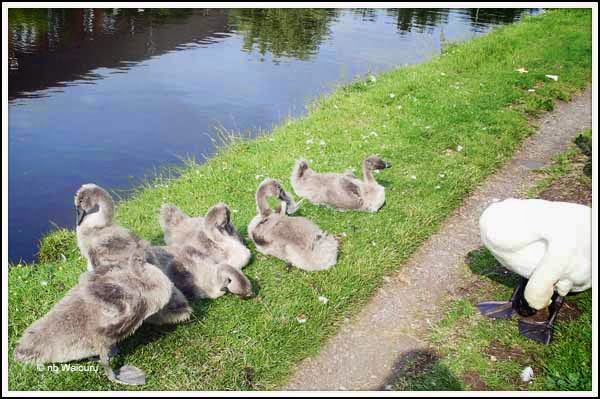 All the swans we have seen appear to be very good parents and they have all had more than two signets. So why isn’t England overrun with an excess of swans? Oh… Yes, I forgot… the Poles are eating them! 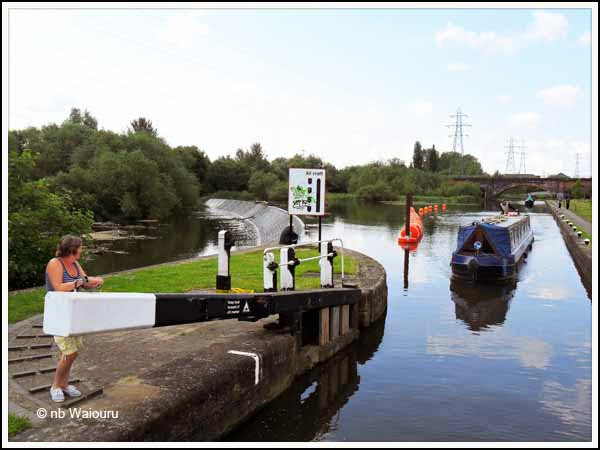 It must have been Jan’s lucky day as we met boats coming in the opposite direction at two of the locks and two others were already in our favour. The weather improved as the day progressed. We started wearing a fleece and by lunch time all that was required was a T-shirt. We attempted to moor above Gee’s Lock but it was too shallow to get against the bank so we dropped down through the lock and found a mooring just beyond the lock mooring bollards. 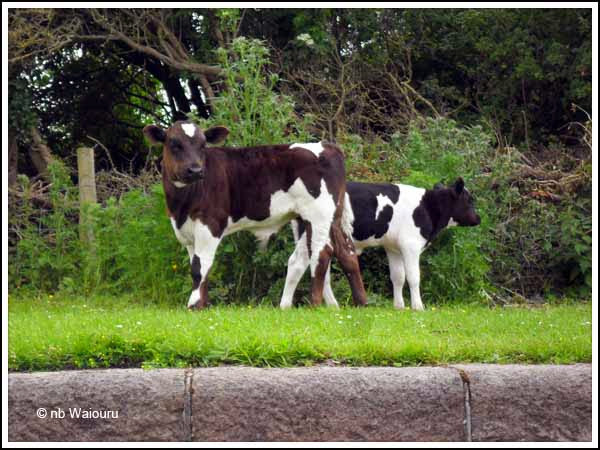 As we entered the lock Hamburger and Mince came charging around the corner of the hedgerow and stood at the side of the lock staring at us. They were joined by Sirloin, Topside and Brisket. Eventually Chuck Steak and Offal joined in to ogle us! I mentioned the magic words “Sunday Roast” and they scarpered back around the hedge. First job was to check the ‘dot in the sky’ could be found by the sat-dome and then the rotary clothesline was erected to get the laundry dry. 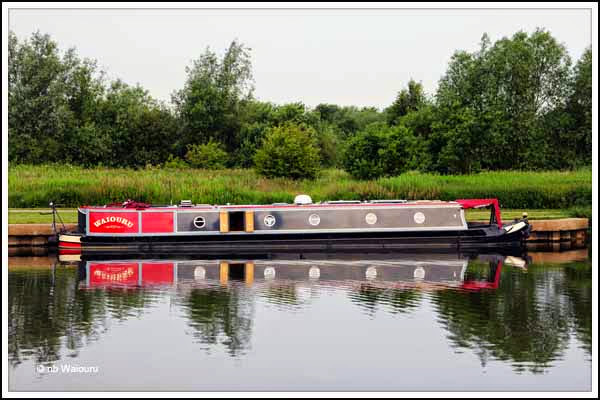 The plan for tomorrow is to get through Leicester and find a mooring on the far side. 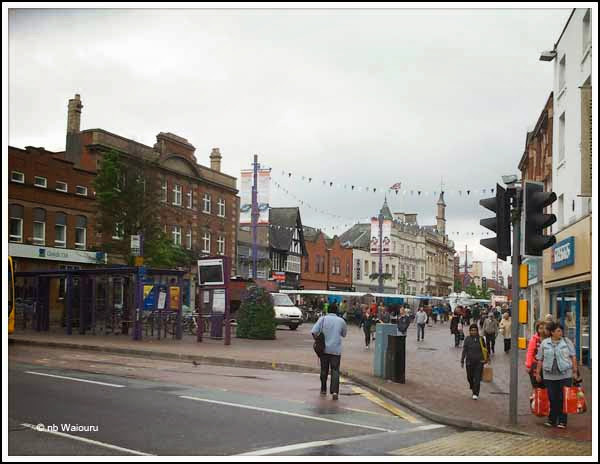 However we also need to stop at the Tesco and Sainsbury’s on “The Mile” in Leicester to restock the cupboards. I’m also mindful of “The Weir”! The crew of the hire boat we met at the water point this morning told us they had a difficult time with the weir as the wind caught the boat. I now recall seeing a photo of this large weir so I’ve been to Google Earth to have a look and do some forward planning. 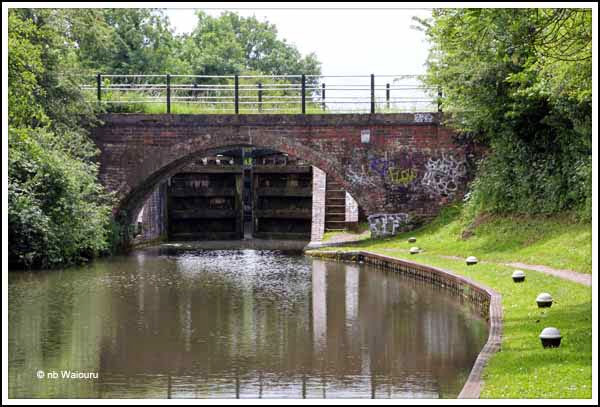 We will be approaching it from the south (bottom) and it looks like the most obvious method will be for Jan to alight at the railway bridge and go forward to the lock on foot. I’ll hover under the bridge until Jan calls me forward. That way we won’t need to moor immediately prior to the lock. All of this may be unnecessary. But better to be safe than sorry! After my recent description of South Wigston the opportunity to go and have a look was irresistible. The round trip was slightly longer than 6km with most of that along the towpath. At Jacobs Crackers Lock I turned away from the canal and headed north through a grass reserve and then a field of thigh high grass. 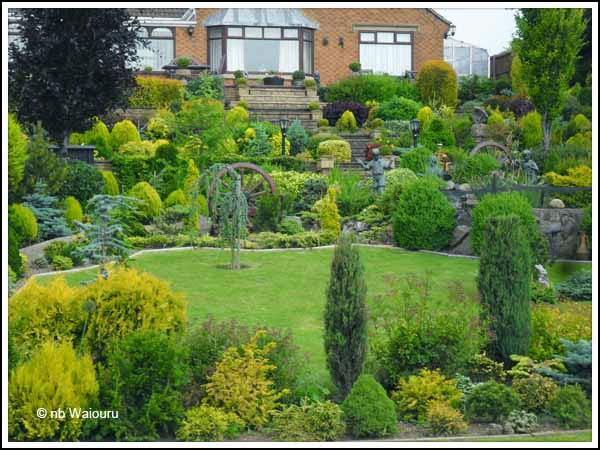 The housing around this part of South Wigston looked very tidy and solid middle-class. However the dwellings to the left of the field of grass (west side) were decidedly less tidy and older. Walking across the vacant field of grass. It’s private property with public access permitted. 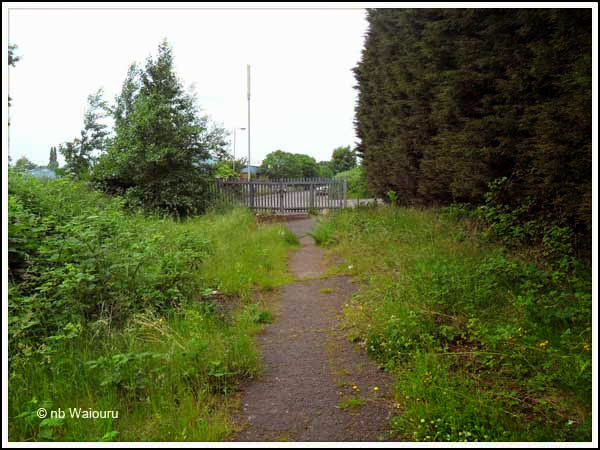 At the far side of the field is a short path that gives access to an industrial estate. A quick left turn followed by a right and a second left brought me to this place. Of course I had a shopping list! So if you’re on the Leicester branch of the Grand Union there is access to a Tesco in South Wigston from Jacobs Crackers Lock. 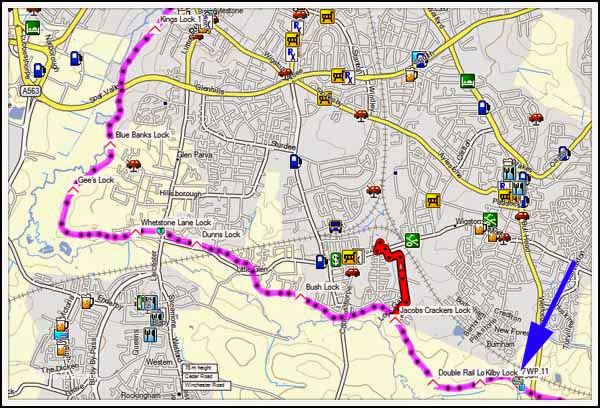 The route can be seen in the following screen dumps. 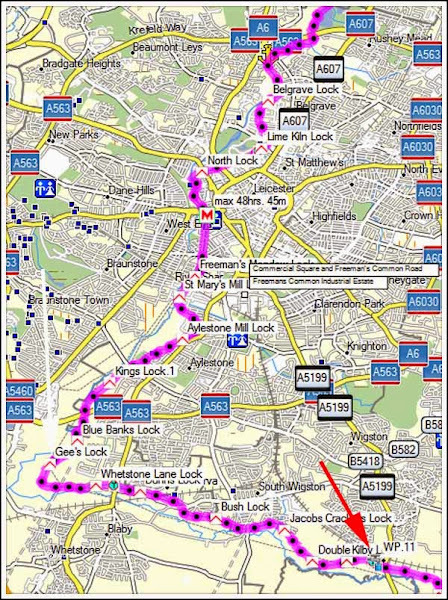 The blue arrow points to the location of the services and moorings at Kilby Bridge. Walk north up the grass reserve and cross the road to the field. 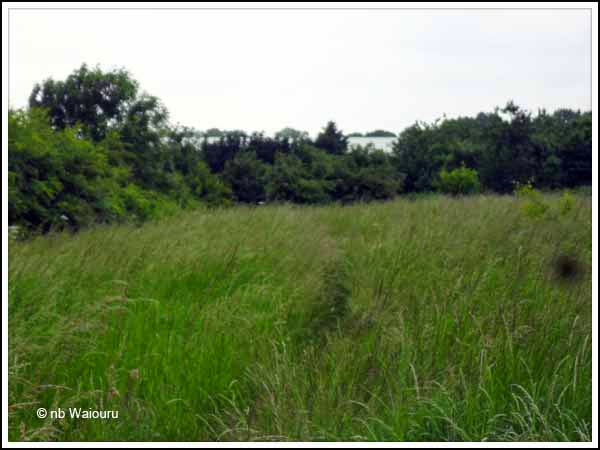 Walk to the top of the ridge and then north through the field to the treeline where there is a path. Follow Magna Road to Tesco. 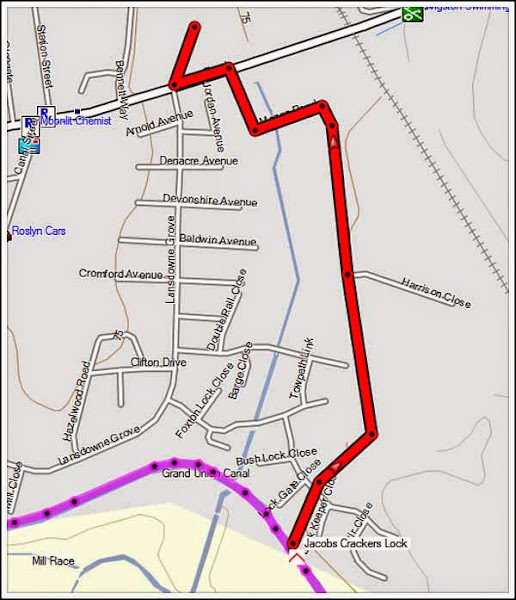 The walk is approximately one kilometre. Oh, almost everyone seemed to be ‘normal’. Only saw one ‘Chav’ who I happened to notice wandering around inside Tesco looking like he was lost! We had a Sunday roast at the local pub (The Navigation) with both of us choosing the pork. There was no way we were going to be able to eat all the vegetables and after doing our best there was no room left for a dessert. I had my eye on the lemon meringue and whilst the brain was willing the stomach said no! A late afternoon walk around Kilby village enabled me to record four footpaths on the gps which have now been uploaded to the Open Street Map. All the sweaty walking clothes are now in the Candy washing machine waiting for our departure tomorrow. Actually we’ll probably complete the washing cycle before leaving here which will enable us to depart with a full water tank. Looking at the map there doesn’t appear to be another water point until after Leicester. Another blogger and the BMV is dishonest! Canal maps that are better than mine!